If you know me at all or have followed me on social media for 5 seconds you have probably heard or seen me mention StudioHop. Quick facts about StudioHop... StudioHop is a multi-studio membership where you get access to some of the best fitness studios around the city all at one monthly price. The membership is $135 a month, but if you use my promo code AnnieHop20 you get $20 off your first month! $115 a month is a steal for everything you get access to. StudioHop originated in Dallas, but is now in Fort Worth, Austin, Tulsa, New Orleans and yours truly OKC! OKC studios that participate in SH include Union Performance, Beyond Studios, Four Graces Pilates, Soul Yoga, This Land Yoga, Yoga at Tiffany's, Body Mind Yoga, Hidden Dragon Yoga, The Yoga Box, Yoga Bliss, Cycle 3 Sixty, Moxieride, Higher Ground Runner and Urban Row. Easily reserve your class through the SH app or online. Now why I love StudioHop... I've been doing StudioHop since February, and can't imagine working out with out. I'm a studio junkie. In a studio setting I find motivation having an instructor pushing me as well as getting to work alongside new or familiar faces who have the same goals. As compared to the intimidating solo act of maneuvering a gym. I'm also slightly ADD, so the ability to hop from one studio to the next, one workout to the next, day after day is ideal for me. Yoga one day, bootcamp the next, followed by pilates mid-week. Not only does this satisfying my spazziness, it's also great for your body. Studies have shown how changing up your workout creates results. You never want your body to get stagnant. Keep it working and challenged by changing up it's routine. My StudioHop favorites include Union Performance, (hi friends ^^), Beyond Studios (remember when #teamtakeabite took over? ), Soul Yoga, Yoga at Tiffany's, The Yoga Box and Four Graces Pilates. StudioHop just released their survey for the "Best of 2017" awards. You bet I'm filling this out highlighting all my favorite classes and instructors! If you're a hopper, make sure to nominate your faves too! Chelsea's lunch class at Union Performance, any class Dallas teaches at Four Graces, the Reform & Run format class at Beyond, Stacy and Janelle's classes at Soul Yoga, the list goes on for all my favorites! Because of StudioHop I am able to continue my practice of yoga, challenge my body at bootcamp and discover my love of pilates. I had never taken pilates until StudioHop and I'm not sure what took so long. Because of the access and luxury of being able to try so many different studios and workouts I was able to find this new workout (to me) and fall in love with it. 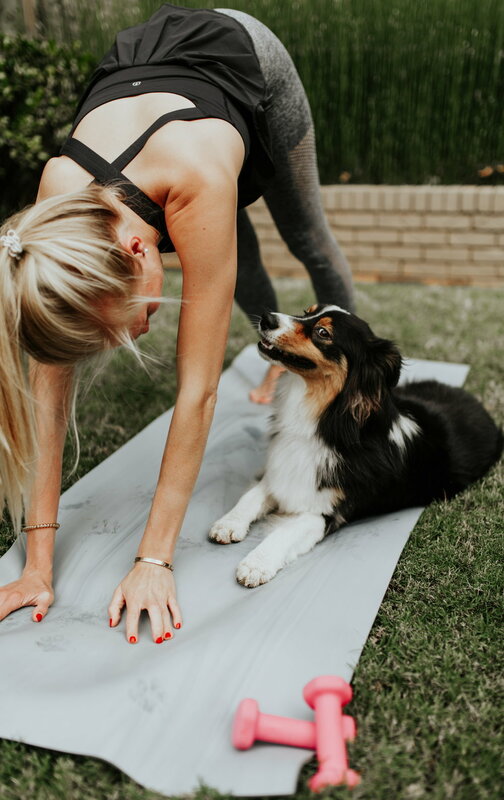 A few things to note about StudioHop...the studios included are not dog friendly, despite Gabe's impressive downward dog ;) You are limited to 5 classes per studio per month. Another thing to mention, if you cancel a class within 12 hours of it's scheduled time you will be charged a $12 late cancel fee. If you don't show up it's $15. My tip** don't sign up until a few hours before a class to make sure you will be making it. In OKC we have the luxury of classes typically not booking up fully so you can afford to sign up closer to time. If you have any questions about StudioHop, please ask! I'm happy to share more about it and my experience. If there is class on SH you want to try, call/text/email/DM me and let's try it together! And last but not least don't forget to use my code AnnieHop20 for $20 off your first month! p.s. 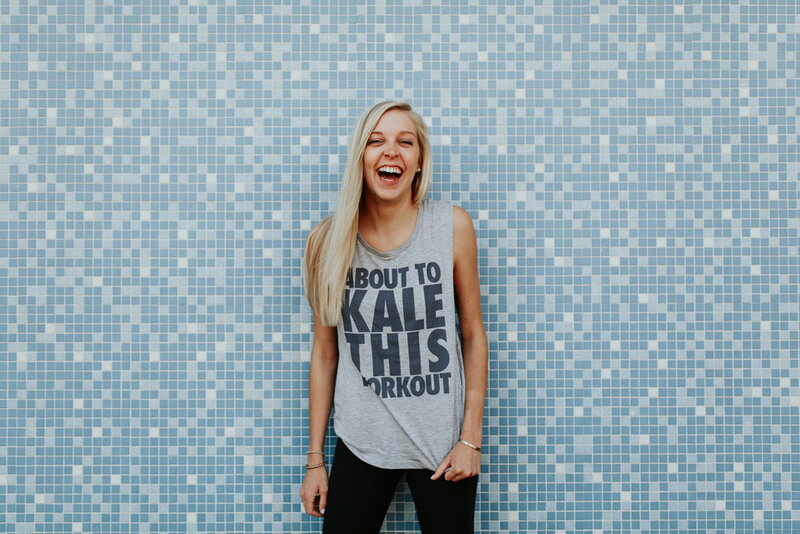 shoutout to Farm Fresh Designs for my adorable Kale Workout tank! And to KGC Photography for all the pics. Today's post is full of knowledge on how to stay healthy and active in your daily life through exercise. The knowledge in this post is better than anything I could try to make up for you-keep reading to see why! Jennifer McGregor and her classmate are both pre-med students and created PublicHealthLibrary.org as part of a class project. They enjoyed developing the website so much that they decided to keep it running and continue to develop it. They are hoping for the site to become a go-to health and wellness resource online. Busy work schedules and personal life make it difficult to exercise. The truth, however, is that it is easier to make excuses than it is to make a commitment to an exercise schedule. By making fitness a priority in your life, you will find that it is much easier to create a schedule for daily exercise and to stick to it. Sometimes simply penciling this into your regular schedule makes it become an automatic part of your day. Okay, so being a morning person may not fit into your current routine. In getting up earlier, committed to exercising, your morning workout will soon become part of your routine. You can get your workout off your to-do list first thing in the morning, and not have to worry about squeezing it in later in the day. People who exercise in the morning often say that it energizes them and enhances their mood. That’s a great trade-off for getting up earlier! Money is a great motivator. If you think that making a little extra cash while exercising sounds like a good idea, there are several options available. One option is to become a dog walker and/or pet sitter. Not only do you get the benefit of hanging out with some awesome dogs, but you get paid to exercise in a fun way. Other great ways to work exercise into your day while getting paid include becoming a mail carrier, guiding walking tours in your area, teaching fitness classes, becoming a ski instructor, or volunteering as a coach or referee. You may be surprised by just how much time you spend on social media, e-mail, or playing games on your phone. If you put down your phone and devote that down time to working out instead of vegging out, you will soon find that exercising can easily become part of your daily life. When you’re done, hop back onto social media and tell the world about your physical conquests! It may not be as structured as thirty minutes on the treadmill, but moving every chance you get will help work physical activity into your day. For example, instead of sitting on the couch while you watch your favorite show, do some squats, pushups, or lunges while you watch. If you keep a jump rope or weights nearby, you may get even more motivated to be active in that down time. Other ways to get active during the day include running in place while cooking, doing squats while folding laundry, or doing pushups with your kids. High Intensity Interval Training (HIIT) is a quick way to work exercise into your daily routine. When you choose an activity, put full effort into it for 10-20 seconds, and then follow with 40-50 seconds of recovery time. You’ll want to include a 5-10 minute warmup, followed by 10-15 rounds of the activity, and then 5-10 minute cool down. You’ll find that you are burning loads of calories in a short amount of time with HIIT. Once you start to really look for the time in your day, you’ll find that there are several options for working exercise in. You don’t have to drive to the gym and take an hour-long class to get active and fit. Simply choose some of these suggestions, and you’ll find that exercise quickly becomes a normal part of your day. It is so important for me to stay active and healthy, especially as I translate back onto the working grind. I sit most hours of the day. Waking up early and getting in meaningful workouts (barre3, HITT or cardio) is super important to me. If I don't do it in the morning the chances are slim I'll be motivated to by the end of the day. I'm also on my phone/computer allllll day (life of a social media job), so taking those breaks to get up and stretch, focus on something else, and rest my eyes is more and more apparent. Thank you for your knowledge Jennifer and for contributing to Take A Bite!